Stuff like this was for people on the fringes of the magical world, people scrabbling to get in, or who’d lost their footing somehow and slipped out of the bright warm center of things, all the way out to the cold margins of the real world. All the way out to a strip mall in Hackensack in the rain. Things like this weren’t for people like him. Welcome to the desert of the real. One professor in grad school, who otherwise took many dubious positions to the point of seeming like a character in an academic novel, liked to say that the real is what hurts. It’s a good working definition. I’d add that the real is what hurts or what works. The latter explains much of what’s wrong with philosophy, and its literary studies branches. When he thought of his parents it was almost like they were old lovers, so distant now that he couldn’t even remember why his link to them had once seemed to real and urgent. They’d managed the neat trick of bringing up a child with whom they had absolutely nothing in common, or if there was something none of them had risen to the challenge of finding it. Friends are arguably the family you choose, but friends are also hard to sustain in world of growth, evolution, and changing circumstances: people must grow together or apart, and in many cases friendships do not survive circumstances. One could be sad or stoic about such things. The book raises other questions. What do the many odd metaphors and pop-culture references mean (“He’d been a good person, or good enough, but mostly what he’d showed Quentin was how to move through the universe while disturbing it as little as possible, and how to compile and maintain the world’s most complete collection of Jeff Goldblum movies on Blu-ray, apart, presumably from Jeff Goldblum’s” or “fairies thought all this military stuff was pretty silly, but they went along with it for the same reason that fairies ever did anything, namely, for the lulz”)? They undercut fantasy tropes but also make the characters highly associative. Another sample: “It was like a box with a whole herd of Schrödinger’s cats in it. With a little magical know-how you could alter the order in which your cards came out; with a little more you could guess what your opponent was going to play before she played it” (note that this comes just a few pages after Quentin explains his poverty—why not just do this in Vegas?). Other notes: There is a MacGuffin. The initial plot about Quentin needing money seems unlikely; he has long had the same problem as the girls on Girls: he needs to get a job, or find a purpose greater than himself. Leading a generative life is important and yet we often get little guidance in this regard. One purpose of novels could be to give us guidance to leading a generative life. Novels show both failure and success, and arguably occasional transcendence towards a quasi godhood rarely if ever achieved by those of us outside books. 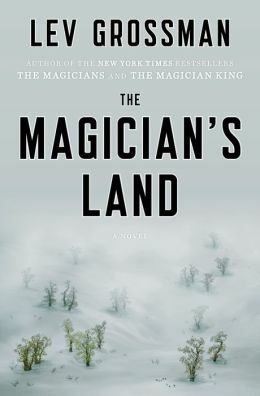 I would argue that Quentin succeeds or seems to at the end of The Magician’s Land—attend to that language about bridges and other connectors—but the possibility of success is there from the beginning, when Quentin finds himself in a bookstore, and “he felt at home in a bookstore. [. . . ] It didn’t matter where you were, if you were in a room full of books you were at least halfway home.” Bookstores represent what is effectively infinite possibility: they are like the Neitherlands, the world between the worlds. I can’t get excited enough about the book to write extensively about it, which may say something about the book or may say something about this writer. Nonetheless, here is an interview on Vox. Here is Slate. Here is The Atlantic. Here is Grossman explaining how not to write your first novel. I think he said in my interview with him that publishing as an industry is no fair and fairly random, which the linked essay perhaps supports. Note: This is based on a review copy.